Should Canada recognize Taipei as the legitimate government of China? Given China's... er.. sorry, more specifically the PRC's behaviour recently, should Canada recognize Taipei as the legitimate government of China? I could see a situation in which Canada would allow only sole proprietorships, worker cooperatives, and consumer-cooperative natural monopolies to import from the PRC proper while allowing all businesses to import from Hong Kong, Macao, and Taiwan for as long as they respect the International Covenant on Civil and Political Rights. All Chinese residents of the PRC mainland who enter Canada should be required to pass a test to demonstrate their knowledge of the Universal Declaration of Human Rights. As for formal diplomatic ties, while Canada could interact with the PRC mainland or even establish visa offices there, its formal recognition would go to Taipei, not Beijing. Re: Should Canada recognize Taipei as the legitimate government of China? Can that include a review of the medical experiments being done on the Indians in Canada's north by the Canadian Government for 'outside parties'?? Annex A of this report provides a sample of photos taken during the visit. and to the control post. admission and discharge sector, which houses two cells. BBC was initially designed to accommodate 41 minimum-security inmates. In 1996, BCC underwent renovations and the bed capacity was increased to 68.
a cement floor, but is either extensively damaged or has been removed entirely. fixed table with 4 attached benches. in a cell, a single mattress rests on the concrete floor beside a bunk bed. small sink, a shower and a toilet. The flooring has been partially removed. This sector does not have a designated common room. additional showers enclosures were out of order), two toilets and three urinals. and no tables or chairs in the gymnasium. rights lens to complement existing assessments and evaluations. nothing short of appalling, and negatively impacts on both inmates and staff. Cells are overcrowded beyond acceptable standards of safe and humane custody. mold is extensive throughout the living units and rank in smell. of inmates, and cannot be cleaned sufficiently due to the high usage. 4. All inmates interviewed and many staff complained about the air quality. the air ducts were last cleaned or the air quality tested. the damaged areas have been replaced, or covered, with plywood. not used in modern institutions managing higher security inmates. negative impact on the integrity of the building in case of fire. overcrowding in a grossly inadequate infrastructure. Last edited by MHz; Jan 11th, 2019 at 11:34 PM.. So, you think barring people from Canada based on their understanding of a document they've never been taught is a good idea. I think we should require you, personally, to explain to each excluded Chinese "We're discriminating against you because we are unhappy with the government over which you have no control." We could make it an open-book test and could even provide a copy in their own language. Try anything funny and the 'White Helmets' will expose your crimes like they did in their last place of business, . . . Syria. You want to end up looking like that??? What be this Flint place as that would mean they were in the US before they infested Syria. It hasn't helped is as we seem to be able to do the opposite and then lie our daces off when questions are asked. I can see why we want to do other people's dirty laundry rather than clean up our own crimes against humanity. The link had more links at the bottom of the article that are the same. To show the difference in the speed of the cleanup and the thoroughness of it shows two very different standards apply. 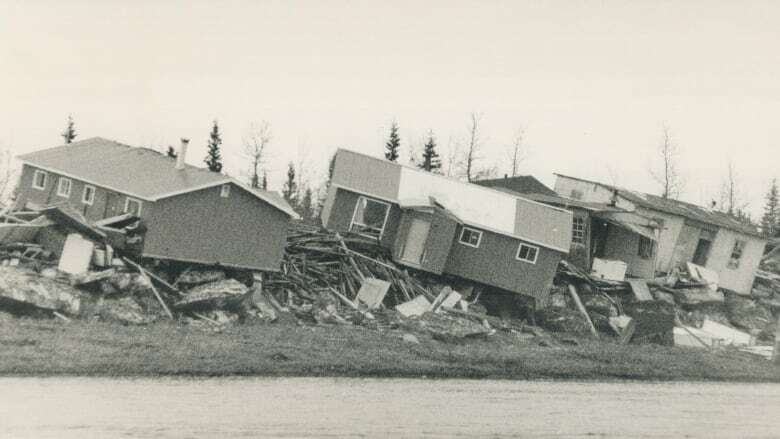 Buckled houses and rubble along the Winisk River are a sad reminder of spring flooding that destroyed all but seven of the Cree village's 60 buildings May 1986. (Dale Brazao/Toronto Star via Getty Images)Thirty years ago this week a flood wiped out a remote northern Ontario community situated on the Winisk River near the coast of Hudson Bay. The settlement is the home of Weenusk First Nation. That same year the community resettled further up river, but the tragic Winisk flood of 1986 is a reminder of what communities along the James Bay must face every spring, when the ice starts to melt and river water starts to rise.